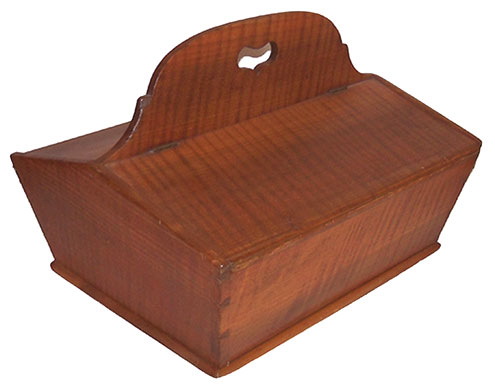 Presented here, a Drop-Dead Gorgeous American Tiger Maple Cutlery Box/Carrier of heroic proportions. Big, bold and gutsy with fabulous Tiger Striping. They just don't get any better than this! The double sided box measures 15-1/4 inches across x 12 inches deep and 7 inches tall. (11 inches tall including the handle with the heart shaped cutout.) Not your ordinary Cutlery Box! The condition is 100% untouched with a wonderful aged patina. Dovetailed construction, circa 1840.